Stems: Stems twining or clambering, twigs glabrous. Leaves: Blades elliptic to oblong, oblanceolate or ovate, 1.2 to 3.2 inches long, .6 to 2 inches wide, base truncate or tapered, apex obtuse to acute; distal 1-2 pairs perfoliate, 1-3 times as long as wide, pair broadly elliptic to oblong-elliptic in outline, apex rounded to acute, margins entire, lower surface conspicuously glaucous, glabrous. Inflorescences: Terminal, 1 to 4 6-flowered clusters. Flowers: Calyx lobes less than .02 inch, oblong to triangular; corollas weakly 2-lipped, deep red to orangish red, 1.4 to 2 inches long, tube gibbous basally, lobes 1/5 to 1/6 as long as tube, spreading to ascending, lower lip 1-lobed, upper lip 4-lobed; stamens 5, exserted; stigma capitate, exserted. Fruits: Berries orangish red to red, .2 to .4 inch. 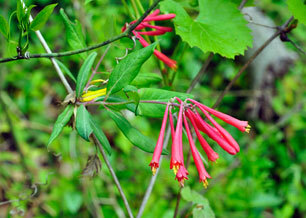 Comments: Lonicera, for German herbalist Adam Lonitzer and sempervirens, evergreen.